In the tradition of The Orchid Thief by Susan Orlean comes Winged Obsession--a gripping, real-life thriller that exposes the seedy underbelly of illegal butterfly trading. 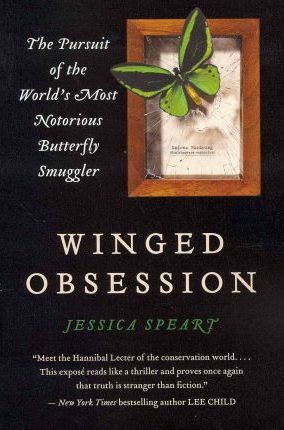 An acclaimed mystery writer and respected journalist specializing in wildlife issues, author Jessica Speart tells an extraordinary but true tale of greed, obsession, and sexual temptation, masterfully chronicling the downfall of the "Indiana Jones of insects" through the determined efforts of a rookie Fish and Wildlife agent who put his life on the line to stop him. One of the world's most beautiful endangered species, butterflies are as lucrative as gorillas, pandas, and rhinos on the black market. In this cutthroat $200 million business, no one was more successful--or posed a greater ecological danger--than Yoshi Kojima, the kingpin of butterfly smugglers. In Winged Obsession, author Jessica Speart tells the riveting true story of rookie U.S. Fish and Wildlife Agent Ed Newcomer's determined crusade to halt the career of a brazen and ingenious criminal with an almost supernatural sixth sense for survival. But the story doesn't end there. Speart chronicles her own attempts, while researching the book, to befriend Kojima before betraying him--unaware that the cagey smuggler had his own plans to make the writer a player in his illegal butterfly trade.